FAIL - I'm not really Stanley Lieber. First time heard of him. Very retro. Cute girls in his videos: double-plus good. He's alright; nothing new really. But... then... I've only just skimmed through his work. So is the colouring on the samurai your work? Nope, this is a vintage photo that I assume was colored when it was made. Late 19th century or very early 20th century, I would guess. 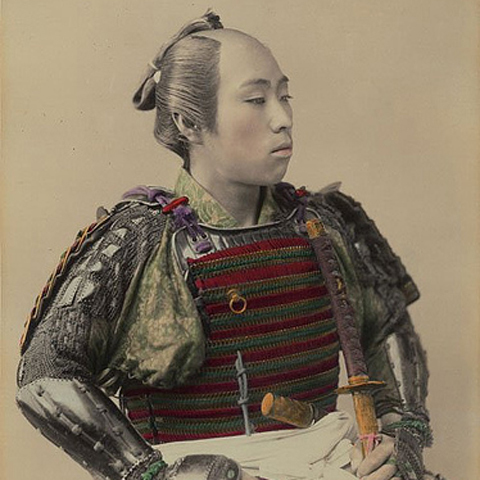 Not much work for the Samurai class in those days. Or at least, not much work as they'd prefer it. Their ancestors worked hard to achieve a social status that has whithered into nothing. Check out Into The Sun. I stand corrected, something new there. Only feudalism could allow the kind of cultivation achieved by samurai.